Past posts in this series have looked at stock market breadth, unique data visualization, volume information, and the NYSE TICK. In this next series post, we'll look at the Dow Jones Industrial Average equivalent of the NYSE TICK: the TICKI. TICKI represents the number of Dow 30 shares trading on upticks vs. those trading on downticks at each moment of the trading day. Its distribution is far noisier than NYSE TICK, as the Dow shares trade frequently and often as part of basket trades executed by institutions. Indeed, one of my favorite uses of TICKI is to examine the frequency of extreme values: +20 or above vs. -20 or below. For a great majority of Dow stocks to be upticking or downticking at the same time, there must be baskets of trades hitting the market on the buy or sell side. This is a nice way of tracking the sentiment of large market participants. If we see many significant positive readings, we know they are lifting offers and executing on the buy side; many significant negative readings suggests a hitting of bids and selling pressure. Because TICKI is so noisy in its moment to moment readings, I keep a cumulative sum of the one-minute average high-low-close readings. 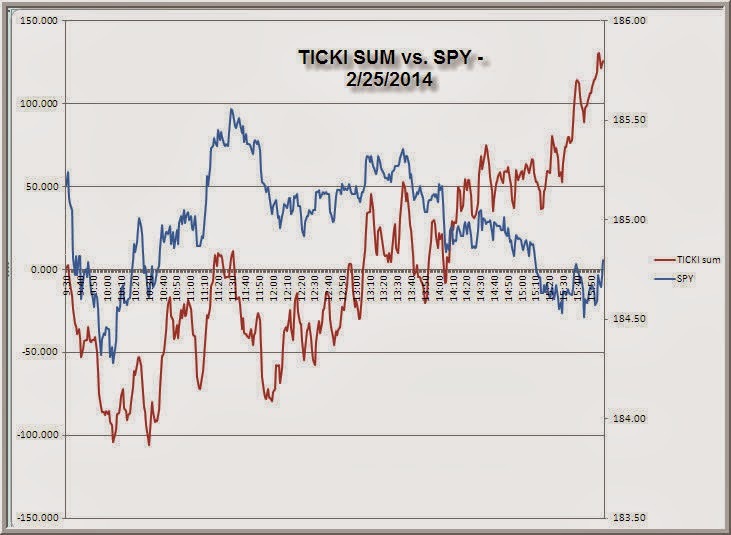 That TICKI Sum measure is depicted above, relative to yesterday's S&P 500 Index (SPY). What you can see is a persistent bid to large cap shares through the session, even as the NYSE TICK was flattish to down on the session. Buy programs in the large caps were going off, but the buying was not across the broad stock universe. That was a nice tell for a mixed market. It was also why I didn't believe we'd sell off significantly during the day session. There are many uses of NYSE TICK and Dow TICKI data. For instance, very short-term intraday traders can use pullbacks in these measures to help time the execution of buy and sell trades. In an uptrend, you want to buy pullbacks in TICK and TICKI--especially when you see pullbacks occurring at higher price levels. The reverse logic applies to downtrends. When you see very few significant high and low readings, you know that institutional players are not dominant in the market and we are much less likely to have a volatile, trend day. Among the high frequency data available to traders, I find the TICK and TICKI to be most useful in gauging market participation and sentiment. Somewhat related information is also found in the Market Delta measure, which I'll be writing about shortly.